This was supposed to be posted back in October last year… just noticed it hadn’t published…. Just a couple of weeks ago I emailed a company called FemmyCycle, the company make a revolutionary menstrual cup which is leakproof! Yes you read correctly leakproof! Now when I emailed them, it took a couple of days but they are really lovely! They asked a few questions about my cycle and other things, so that they could recommend which cup would be best for me to use. Now because of my condition (see my previous post if you want to know what my condition is), each period is completely different and so they couldn’t give a good recommendation of which cup would be best, so they sent out the three different sizes they do, which are teen, low cervix and regular. The shipping was super speedy, if I remember correctly they arrived in just 5 days! I was absolutely amazed! 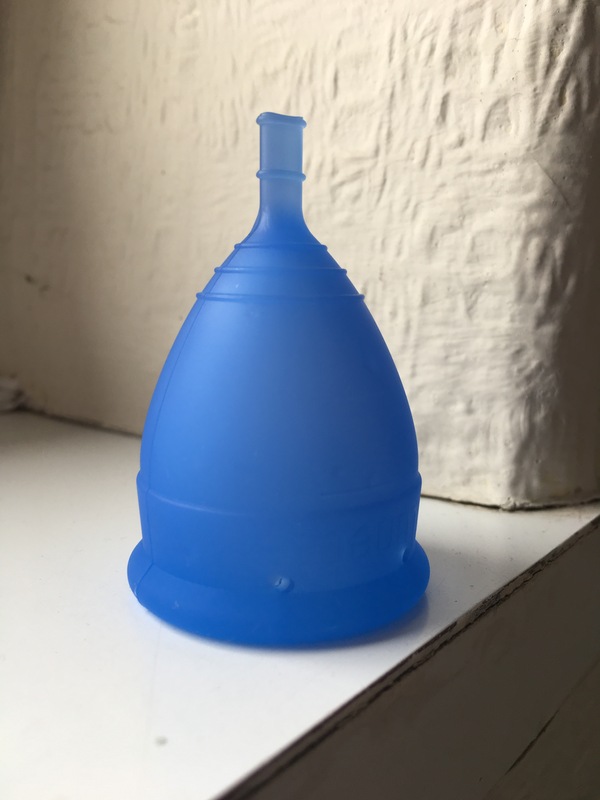 I was really excited for them coming because of the amazing things I’d heard about the FemmyCycle cups, because they are completely different to the “normal” menstrual cups. Purely because they don’t open fully like a normal cup does and because of the unique design the help to guide the blood into the cup and stop it from leaking out (you’ll see by the attached photos). So on to the review! Now, as in my lunette review, I’ve just had knee surgery….. again! Opposite knee this time, but thankfully, my period although ever so slightly late has been blissfully uneventful! I am a bit further along in my recovery time than with my lunette review, so I can bend my knee more than last time. So my period started off with the usual cramping, so having already sterilised all three femmycycle cups, I put the teen size in, as the first couple of days I’m very light, and my cervix is up pretty high but not much happens… so two days in no leaks! 😱😱😱😱 Period starts to get a bit heavier so I swap to the regular size, just for that extra protection… 4 days in….. still no leaking 😱😱😱😱. My cramping has now stopped so i feel comfortable enough to try the low cervix size, so I swap to the low cervix…. now this is where we hit a little snag, day 5… no leaks…. day 6….. and sadly we have a leak, I don’t know what happened or how… I blame my body on this one, somehow the cup had slipped onto its side 🤷🏻‍♀️🤷🏻‍♀️🤷🏻‍♀️🙄🙄🙄, but it’s a very very minor leak, so I take it out, empty it and reinsert, feel around to make sure it’s in the correct position this time and then carry on with my day… but the same thing happens, as I’m out for the day I couldn’t just swap to another cup, so when I get home, I get changed and swap to the regular cup. Safe to say the low cervix cup just didn’t work for me! Overall first month with the FemmyCycle has been fabulous! I now know which cups work best for me so I’ll use that combination next month! So like clockwork Mother Nature arrives, I start with the trusty regular size, everything is going swimmingly until, my body throws a hissy fit and literally expels the cup from my body, I try several times but to no avail, I even try my old faithful lunette, but my body won’t even tolerate that either. But apart from my body throwing a hissy fit month two was uneventful. I love the FemmyCycle cups they are truely leakproof, unless your body has a hissy fit like mine and expels them from your body you’ll do just fine. So I got the tell tale signs I was about to start my period, so followed the instructions of how to sterilise it for the first time (it says to boil it for 20 minutes) so off I go downstairs to boil my cup. Once it’s been boiled I leave it to cool which doesn’t take too long and then pop upstairs to the bathroom, fold it in half and pop it in. Now I have to admit, I’m a pad girl, only recently did I start using tampons because I’ve never found tampons comfortable, so inserting the Lunette Cup felt weird to say the least, but once it was in and had been in for a couple of hours, I didn’t even notice it! I go about my daily routine with no issues, now usually with my period I’m light for the first couple of days and then have a couple of heavy days, now this is where I could have done with the larger cup (I will definitely be investing in the larger one) as I did leak, although not a lot, I hadn’t quite got the timing of emptying it before it got too full. But apart from the one leak incident, my period was much more comfortable and less of a faff. Now month two was an interesting time to have a period, as I had just had a mpfl (medial patellofemoral ligament) reconstruction on my right knee. So just getting around was a challenge in itself, trying to insert when you can’t really bend your leg very well…. well here’s where I’m glad I’m extra flexible! For the first 2 days I didn’t dare try and insert incase I twisted my knee the wrong way, so I stuck with my reusable pads, but because I couldn’t get round easily, I spent those two days mostly sat with my leg up…. causing much frustration and discomfort…. so with a dose of painkillers and relaxing as best I could, I inserted the cup and instantly felt sweet relief from the pads. The rest of my period was spent just sitting around while resting my leg. 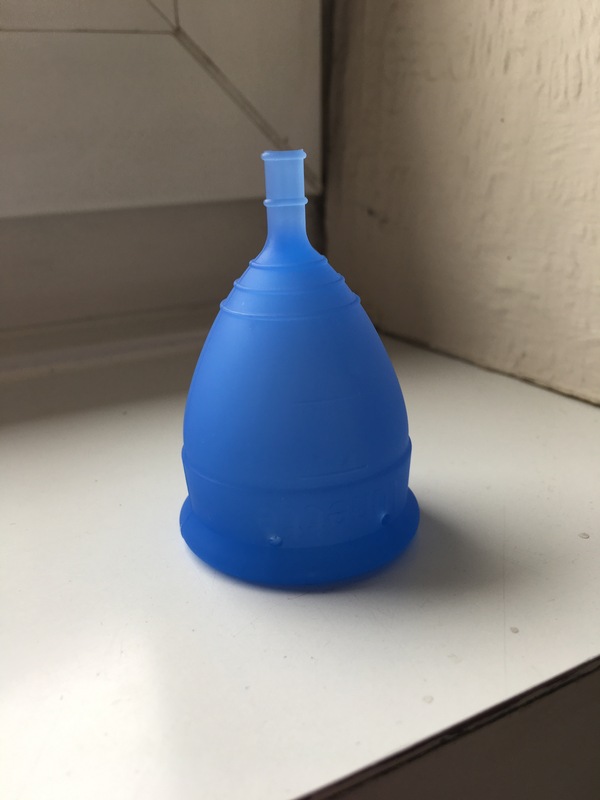 So I give the Lunette menstrual cup 10/10 because I do really love my cup, I’m just gutted I didn’t discover them sooner! Slumbersac’s Sleeping Bag with feet! So recently I’ve been trying to get Elena to sleep in her own bed with her being almost 4…. we only had one problem….. she would kick the covers off in the middle of the night and get cold, ultimately ending up back in with me….. its like sleeping with an octopus….. she wriggles and moves around all night *rolls eyes* so we first tried a grobag, but she would wake up having gotten tangled in it and I’d end up taking it off in the middle of the night and she’d end up in with me again. I then started researching how to keep her warm in the middle of the night when she would kick the covers off. This is when I came across the company slumbersac…. 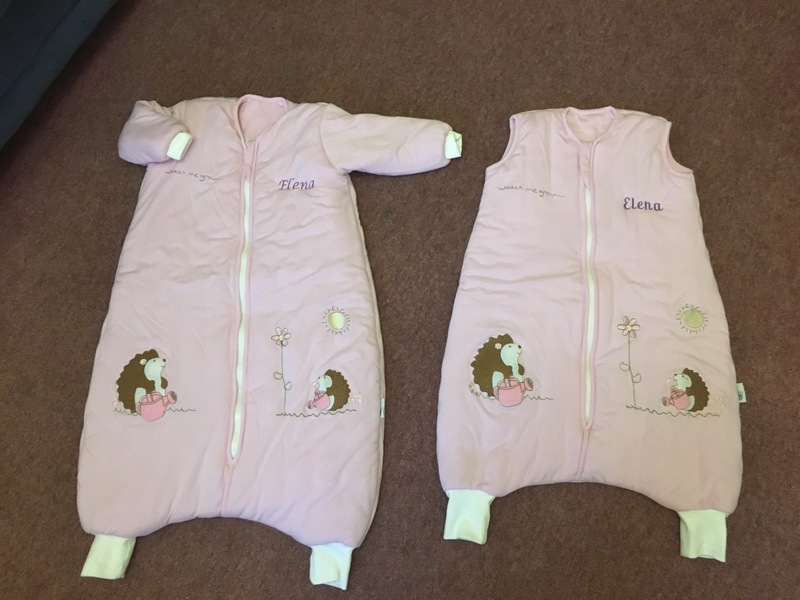 now they do sleeping bags like the grobags but they also do a sleeping bag with feet. Aha I thought…. we might be onto something here…. so I ordered one just to try. First I ordered a sleeveless one in 12-18 months old because of Elena being small it fit her perfectly. So night one we tried it and it worked beautifully until 4am when her arms got cold and she ended up in with me, albeit in her sleeping bag. So a couple of days later I ordered a second one with sleeve’s in what they call their winter weight which is around 3.5 tog, the original one I bought was just the standard tog of 2-2.5 tog. So night 3…. 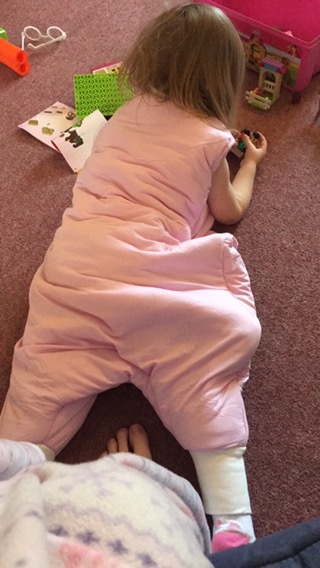 new sleeping bag, slightly bigger size of 18-24 months a pair of socks and off to bed we went…. well for the first time in a long time, she slept peacefully in her own bed till 6am! She was toasty warm when I took her out for bath time (she insisted on keeping it on for breakfast…. can’t complain) unfortunately after a couple of washes the zip gave out, some of the teeth had come off the bottom of the zip resulting in the zip splitting. Thankfully for that night, magic grandad managed to get the zip back together till the morning, when I emailed slumbersac’s customer services’ who were absolutly fabulous and immediately sent out a replacement which arrived the next day. New post coming in the next couple of weeks…. So I’m going to be doing a few more posts in the next couple of weeks so keep popping by to see what they’re going to be…. the next post will be on Slumbersac’s sleeping bags with feet!